Green spaces within cities have great values. From history, we´ve learned they play an important role for health and social qualities when our cities some hundred years ago suffered from the industrial revolution. At that time a reaction started, social and green movements occurred and became driving forces for change. They showed the necessity to create livable cities. Today we admire the green result of all the efforts: Hyde Park, Tiergarten, Birkenhead Park by Sir Joseph Paxton that inspired Olmstead’s work for the Central Park in New York, green belts of Vienna and Bois de Boulogne just mentioning a few of them. A lot has happened since. But action in history is a good parallel when we today identify other challenges when turning postmodern cities into sustainability. Challenging from two perspectives – the global and the local. On the global level we have world leader´s statements from the Rio declaration in 1992, the Kyoto protocol in 1997 and its agreement in 2005 and UN Climate Change Conference – COP 15 – in Copenhagen 2009. On the local level politicians and officials understood that global problems mean local actions. One city understood the new agenda very fast – Copenhagen the capital of Denmark. In 2010 and 2011 the city suffered from extremely heavy downpours. Heaven opened up and cellars, streets and parks were flooded all over the city. However, the administration was a little bit prepared. There was a new Wastewater Plan, a new Strategy for Biodiversity and a Green Structure Plan. Together they were the base of the “Climate Adaption Plan” – accepted in 2011. Based on research and the cities own survey´s and investigations a number of methods was suggested as: larger sewers for taking care of rainwater, steering the distribution of storm water, new dykes to prevent the city from sea-flooding and more green and blue to cool rising temperature. “We need solutions that improve the city´s physical environment and create attractive urban spaces. Climate adaption can be used to raise the quality of life for Copenhageners”. This is an important statement: promising, ambitious and very challenging. On a comprehensive level, the plan proposes strategies and measures. One of those says that “A greener Copenhagen is better equipped for the climate of the future” and propose three activities. Copenhagen has many parks of great value, areas of natural interest and private and public green areas and gardens. Changes and improvements must contribute to climate adaptation of the city, highlighting the identity of individual sites and offering interesting and valuable experiences and activities to Copenhageners. Trees, green roofs and facades, water gardens and underground basins, gardens etc. can contribute to adapting the climate while revitalising the schools, institutions, backyards, public spaces, streets or neighbourhoods at the same time. One action to be mentioned is the “policy and planning of green roofs” and their role for absorbing rainwater, reducing temperature, creating habitats and increasing the functionally of buildings and cities. This policy is realised in well-known projects as the City Dunes of SLA architects and 8-house designed by BIG architects and in several local plans. A green network can consist of trees, green roofs and facades, gardens, beds and green backyards. For the city as a whole, it is about creating coherence between the city’s large green places and blue areas. Green networks can contribute to creating attractive links between Copenhageners and their natural surroundings, contributing to the local dissipation of rainwater and improving the urban climate. In total, the plan aims at a new type of urban nature that does not look at city and nature, building and biology to be opposites. Instead it makes urban nature a vitalizing and inviting hybrid. Planning is also about the time-schedule. The conference COP 15 was held in 2009, The heavy downpours was in 2010 and 2011, the climate adaption plan was decided in 2011 and its first urban space was realised in 2014. This project isn´t the biggest but is an excellent showcase for a new design of a public space. Many skilled professionals contributed – here I mention GHB landscape architects. The site “Tåsinge Plads” is located in the inner-city district of Osterbro. Instead of flooded streets and asphalt a small green square and a piece of new urban nature was realised. It both handles large volumes of rainwater and creates a place for the neighbourhood’s residents to meet. Urban life combined with nature! You can enjoy a cup of coffee and discover a small ‘Danish rainforest’. In the design you see water-features present everywhere: a delta-system of playful mini-canals, umbrella-like shelters for the rain and the sun and a small bridge over the sunken garden. Underground basins clean rainwater from surrounding roofs. Tåsinge plads shows that theories and policies must be turned into reality to be understood and respected. The lesson is that dialog with people demands action. It is very impressive to see the information-signs about climate change. Public space is used for education – making “a new trend to be your friend” so to say. New project´s is on the planning stage. One is the outcome of a landscape-competition in 2015. 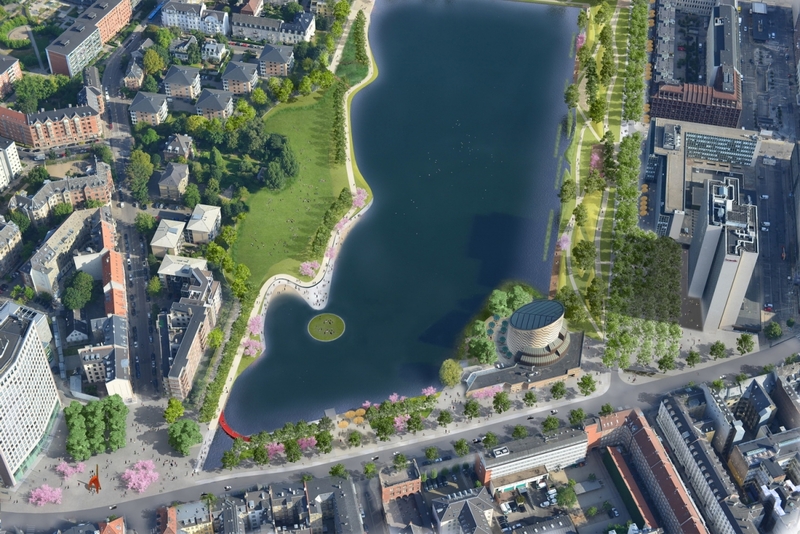 The winning proposal named “The Soul of Norrebro” by SLA Landscape architects, is an integrated urban design and climate adaption project for a park (Hans Tausends Park) and a street (Korsgade). The project combines urban nature, local community and smart downpour solutions. Rainwater is collected and used locally while excess water from downpours is lead from the park to a lake, being cleansed by urban nature biotopes along the street. The project´s theoretical fundament is that hydrological, biological and social circuits must and will work together in a strong symbiosis. Copenhagen is obviously on the track to improve the environment for the Copenhageners and this is a very important outcome. But world community has also seen that Copenhagen is taking a leading role in the work for climate adaption. Awards, prizes and credits has already been given to the city. Their work in the front line has also given a lot of contacts and opportunities for new networks, collaborations and possibilities to export new know-how. We all hope that Copenhagen will continue in an open-minded and inclusive way. In a well-known song (at least among Danish people) from the 60´th the American actor Danny Kaye did sing “Wonderful, Wonderful Copenhagen”. What has happened now has given that expression a new dimension – about responsibility, sustainability and shared visions – and the obligation to make them true.